Jean Bernard Leon Foucault (18 September 1819 - 11 February 1868) was a French physicist best known for the invention of the Foucault pendulum, a device demonstrating the effect of the Earth's rotation. He also made an early measurement of the speed of light, invented the gyroscope, and discovered eddy currents. A. Charlois discovered asteroids #374 Burgundia, #375 Ursula and #376 Geometria. A. Kopff discovered asteroids #606 Brangane, #607 Jenny and #608 Adolfine. K. Reinmuth discovered asteroids #922 Schlutia and #3500. Nikolai Nikolayevich Rukavishnikov (18 September 1932, Tomsk - 19 October 2002) was a Soviet cosmonaut who flew three space missions of the Soyuz program: Soyuz 10, Soyuz 16, and Soyuz 33. Two of these missions, Soyuz 10 and Soyuz 33 were intended to dock with Salyut space stations, but failed to do so. Rukavishnikov studied at the Moscow Engineering and Physics Institute and after graduation worked for Sergey Korolev's design bureau. He was selected for cosmonaut training in 1967. He resigned from the space program in 1987 and returned to work for the same bureau he started with, by then known as Energia. He died of a heart attack on 19 October 2002. A. Bohrmann discovered asteroid #2016 Heinemann; C. Hoffmeister discovered asteroid #3203. Y. Vaisala discovered asteroids #1524 Joensuu, #1525 Savonlinna and #1536 Pielinen. The US Navy launched the 96 pound Vanguard 3 satellite from Cape Canaveral, Florida, to collect radiation and micrometeoroid data. Though it reached orbit, the third stage failed to separate from the payload, the mission was considered a partial success. NASA launched the TIROS 6 weather satellite from Cape Canaveral, Florida, which returned 66,674 cloud cover images during its active life. TIROS 6 (Television and InfraRed Observation Satellite) was designed to further demonstrate the capability of a satellite to observe, record, and transmit TV cloud cover pictures for use in operational weather analysis and forecasting, and returned 66,674 cloud cover images during its active life. The spin-stabilized satellite was in the form of an 18-sided right prism, 107 cm across opposite corners and 56 cm high, with a reinforced baseplate carrying most of the subsystems and a cover assembly (hat). Electrical power was provided by approximately 9000 1x2 cm silicon solar cells mounted on the cover assembly and by 21 nickel-cadmium batteries. A single monopole antenna for reception of ground commands extended from the top of the cover assembly. A pair of crossed-dipole telemetry antennas (235 MHz) projected down and diagonally out from the baseplate. The satellite spin rate was maintained between 8 and 12 rpm by the use of five diametrically opposed pairs of small solid-fuel thrusters mounted around the edge of the baseplate. Proper attitude was maintained to within a 1- to 2-degree accuracy by use of a magnetic control device consisting of 250 coils of wire wound around the outer surface of the spacecraft. The interaction between the induced magnetic field in the spacecraft and the Earth's magnetic field provided the torque necessary for attitude control. The satellite was equipped with two 1.27 cm (half inch) vidicon TV cameras, one medium angle and one wide angle, for taking Earth cloud cover pictures. The pictures were transmitted directly to either of two ground receiving stations or were stored in a tape recorder on board for subsequent playback, depending on whether the satellite was within or beyond the communcation range of the station. The satellite performed normally from launch until 29 November 1962, when the medium-angle camera vidicon failed. The wide-angle camera vidicon system failed on 21 October 1963, and the spacecraft was deactivated shortly thereafter. NASA launched the SA-7/AS-102 Apollo systems test mission from Cape Canaveral, Florida, the third orbital test, and the first closed-loop guidance test. Apollo Mission A-102, flown using the SA-7 Saturn 1 vehicle, demonstrated the Saturn Block II launch vehicle and CSM spacecraft compatibility, and tested the launch escape system. It carried a boilerplate command and service module (BP-15) and an instrument unit to Earth orbit. 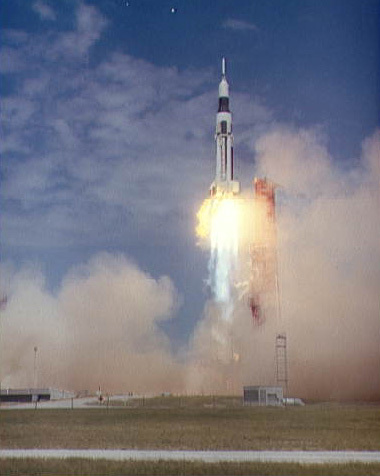 The Saturn 1 launch vehicle was a two-stage booster with the Apollo payload attached to the S-IV second stage. The Apollo payload was a boilerplate command and service module (BP-15). The command module was an aluminum structure simulating the size, weight, shape, and center of gravity of a crewed Apollo command module. It was a 356 cm high conical structure with a base diameter of 391 cm, and was covered with cork insulation to prevent overheating. A 305 cm high escape tower was mounted on top to support a 470 cm launch escape motor. The service module was a 391 cm diameter, 358 cm long aluminum structure mounted beneath the command module. It was attached to an insert section, which was attached to an adaptor section, which remained with the instrument unit and S-IV second stage. The Apollo boilerplate had a mass of 7800 kg, the entire Apollo-instrument unit-second stage payload had a mass of 16,650 kg in orbit and was 24.4 meters long. The spacecraft was instrumented for 133 measurements such as heat rates, temperatures, aerodynamics, and static loads. The Saturn 1 placed the boilerplate Apollo CSM instrument unit and spent S-IV stage in an Earth orbit similar to the interim orbit planned for future Apollo astronaut missions. An elaborate system of eight motion picture cameras and one TV camera was mounted on the S-1 stage to record flight events. The motion picture cameras were ejected following the S-1 powered flight, but were not recovered. No recovery of the satellite was planned, and the orbit decayed on 22 September after 59 orbits, and the spacecraft disintegrated on re-entry. Telemetry was obtained from 131 separate and continuous measurements. All test objectives were met, including final verification of the Saturn 1 propulsion, guidance, and structural systems, development testing of the Apollo spacecraft during atmospheric exit, test jettisoning of the CSM launch escape system, and compatibility of the CSM with the launch system. Purple Mountain Observatory discovered asteroid #2380 Heilongjiang. USSR's unmanned Zond 5 flew around the Moon with a biological package, the first animals to reach the Moon, making its closest approach to within 1950 km, in the first successful circumlunar Earth return and recovery mission. Zond 5 was launched 14 September 1968 from a Tyazheliy Sputnik (68-076B) in Earth parking orbit to make scientific studies during a Lunar flyby and to return to Earth, an unmanned test flight of the Soviet manned spacecraft equipment. En route to the Moon, the main stellar attitude control optical surface became contaminated and was rendered unusable. Backup sensors were used to guide the spacecraft. On 18 September 1968, the spacecraft flew around the Moon, the closest approach being 1,950 km. High quality photographs of the Earth were taken from a distance of 90,000 km. A biological payload of turtles, wine flies, meal worms, plants, seeds, bacteria, and other living matter was included in the flight. According to the Russian Academy of Sciences, the pilot's seat was occupied by a 175 cm tall, 70 kg mannequin containing radiation detectors. Returning to Earth, the gyroscopic platform went off line due to a ground operator error, making the planned guided entry impossible, forcing the spacecraft controllers to use a direct ballistic entry. Unlike the Zond 4 mission, which had re-entered over western Africa in April, the self destruct command was not given. On 21 September 1968, the reentry capsule entered Earth's atmosphere. Communications with Zond 5 were lost as it re-entered over the South Pole. It had to re-enter at an angle of 5 to 6 degrees to the horizontal: One degree too high, and it would skip off the atmosphere and be lost into space; one degree too low and the G-forces would increase from 10-16 to 30-40 - not only enough to kill the "crew," but to destroy the spacecraft. The safe entry corridor was only 13 km across, and had to be hit at 11 km/sec - "like hitting a kopek [Russian penny] with a rifle at a 600 meter range." After the ballistic 20G re-entry, the capsule braked aerodynamically, deployed parachutes at 7 km, and splashed down in the backup area in the Indian Ocean at 32.63 degrees S, 65.55 degrees E. Soviet naval vessels were 100 km from the landing location and successfully recovered the spacecraft the next day, shipping it via Bombay (3 October 1968 aboard the Vasiliy Golovnin) back to Soviet Union, safely returning the biological payload to Moscow on 4 October 1968. It was announced that the turtles (actually steppe tortoises) had lost about 10% of their body weight, but remained active and showed no loss of appetite. The mission was planned as a precursor to manned Soviet Lunar spacecraft flights. USSR launched the Meteor 1-22 weather satellite from Plesetsk to acquire meteorological information needed for use by the weather service. N. Chernykh discovered asteroid #3461. 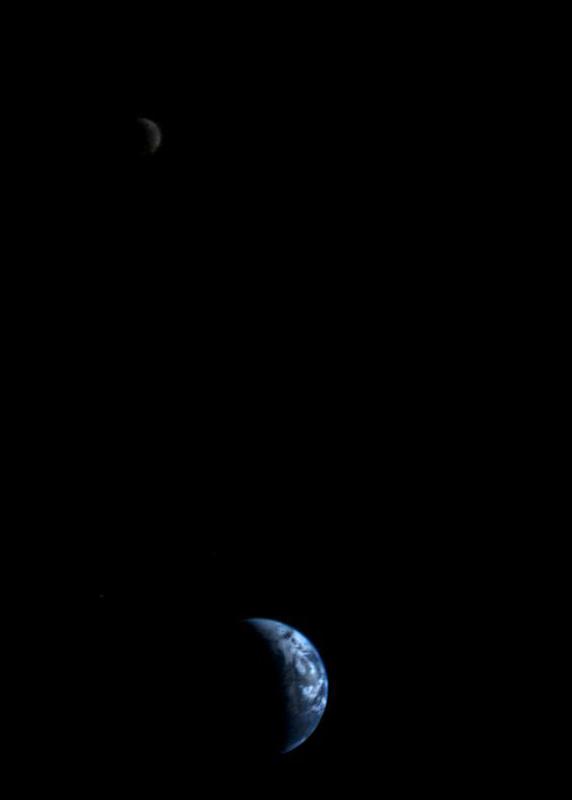 NASA's Voyager I probe took the first space photograph of the Earth and Moon together. USSR launched Soyuz 38 from Baikonur carrying the seventh international crew under the INTERCOSMOS program to Salyut 6, comprised of Y. V. Romanenko (USSR) and A. Tomaio Mendez (the first Cuban cosmonaut), to conduct scientific research and experiments. USSR launched a Soyuz booster from Baikonur to send the Progress 15 unmanned resupply vessel to Salyut 7, which also carried the Astrozond satellite to orbit. USSR launched Progress 15 on 18 September 1982, an unmanned supply vessel lofted to the Salyut 7 space station. It docked with Salyut 7 on 20 September 1982 at 06:12:00 GMT, undocked on 14 October 1982 at 13:46:00 GMT, and was destroyed in reentry on 16 October 1982 at 17:08:00 GMT. Total free-flight time 4.19 days. Total docked time 24.32 days. NASA's STS 48 (Discovery 13, 43rd Shuttle mission) ended after carrying the UARS (Upper Atmosphere Research Satellite) experiment platform to orbit. STS 48 was launched 12 September 1991. The launch was delayed 14 minutes by a faulty communication link between KSC and Mission Control in Houston. STS 48's primary payload, the Upper Atmosphere Research Satellite (UARS), was deployed on the third day of the mission. During its planned 18-month mission, the 14,500-pound observatory was to make the most extensive study ever conducted of the Earth's stratosphere, an upper level of the planet's envelope of life-sustaining gases, which also includes the protective ozone layer. UARS had ten sensing and measuring devices: Cryogenic Limb Array Etalon Spectrometer (CLAES); Improved Stratospheric and Mesospheric Sounder (ISAMS); Microwave Limb Sounder (MLS); Halogen Occultation Experiment (HALOE); High Resolution Doppler Imager (HRDI); Wind Imaging Interferometer (WINDII); Solar Ultraviolet Spectral Irradiance Monitor (SUSIM); Solar/Stellar Irradiance Comparison Experiment (SOLSTICE); Particle Environment Monitor (PEM) and Active Cavity Radiometer Irradiance Monitor (ACRIM II). Secondary payloads flown on STS 48 were: Ascent Particle Monitor (APM); Middeck O-Gravity Dynamics Experiment (MODE); Shuttle Activation Monitor (SAM); Cosmic Ray Effects and Activation Monitor (CREAM); Physiological and Anatomical Rodent Experiment (PARE); Protein Crystal Growth II-2 (PCG II-2); Investigations into Polymer Membrane Processing (IPMP); and the Air Force Maui Optical Site (AMOS) experiment. STS 48 ended 18 September 1991 when Discovery landed on revolution 81 on Runway 22, Edwards Air Force Base, California. The landing was scheduled for the Kennedy Space Center, Florida, but was diverted to Edwards due to bad weather. Rollout distance: 9,384 feet. Rollout time: 50 seconds. Launch weight: 240,062 pounds. Landing weight: 192,780 pounds. Orbit altitude: 313 nautical miles. Orbit inclination: 57 degrees. Mission duration: five days, eight hours, 27 minutes, 38 seconds. Miles traveled: 2.2 million. The orbiter was returned to KSC on 26 September 1991. The flight crew for STS 48 was: John O. Creighton, Commander; Kenneth S. Reightler, Jr., Pilot; James F. Buchli, Mission Specialist 1; Charles D. Gernar, Mission Specialist 2; Mark N. Brown, Mission Specialist 3. NASA's STS 69 (Endeavour 9, 71st Shuttle mission) ended after carrying the SPARTAN 201-03 and WSF-2 experiment platforms to orbit. The launch of STS 69 was originally set for 5 August, but postponed indefinitely to allow further review of solid rocket motor nozzle joint hardware from the two previous missions, STS 70 and STS 71. An inspection team was formed to assess the significance of a gas path in nozzle internal joint number 3, extending from the insulation in the motor chamber to, but not past, the primary O-ring seal. The team concluded the nozzle joint design was sound and that gas paths were being created when Room Temperature Vulcanizing (RTV) insulation material was applied. Small air pockets were forming in the thermal insulation that could later become pathways for hot gas during motor operation. Attention then focused on developing procedures to allow Non-Destructive Evaluation (NDE) inspection of the insulation at the pad, and a new launch date of 31 August was set. Nozzle joint insulation of boosters assigned to missions STS 73 and STS 74 was also repaired at KSC, but that work did not impact the launch schedule. The 31 August launch try was scrubbed about five and a half hours before liftoff due to failure of one of the orbiter's three fuel cells. Fuel cell No. 2 indicated higher than allowable temperatures during activation as the countdown proceeded. The fuel cell was removed and replaced. The liftoff on 7 September was preceded by a smooth countdown. STS 69 marked the first time two different payloads were deployed and retrieved during same mission. It also featured an extravehicular activity to practice for International Space Station activities, and to evaluate space suit design modifications. First of the two primary payloads, Spartan 201-03, was deployed on flight day two. This was third Spartan 201 mission in a planned series of four. Its primary objective was to study the outer atmosphere of the Sun and its transition into the solar wind that constantly flows past Earth. Timing of the Spartan 201-03 flight was intended to coincide with the passage of the Ulysses spacecraft over the Sun's north polar region to expand the range of data being collected about the origins of the solar wind. The Spartan 201-03 configuration featured two scientific instruments, the Ultraviolet Coronal Spectrometer (UVCS) and the White Light Coronagraph (WLC). UVCS measured characteristics of light emitted by neutral hydrogen atoms in the solar corona, the outermost portion of the sun's atmosphere from which the solar wind evolves. The WLC imaged the changing shape and form of the corona. Concerns arose about the performance of the two instruments when Spartan was retrieved after about two days of data-gathering. As the orbiter approached the free-flying spacecraft, it was rotating slowly, and located in a different attitude than expected for retrieval. However, later analysis confirmed UVCS and WLC operated smoothly, with WLC obtaining good data over 95 percent of the planned observing sequence and UVCS preliminary data found to be excellent. Analysis was under way to determine why Spartan behaved as it did prior to retrieval. The second primary payload, Wake Shield Facility-2 (WSF-2), was deployed on flight day five, and became first spacecraft to maneuver itself away from the orbiter, rather than other way around, by firing a small cold gas nitrogen thruster to maneuver away from Endeavour. WSF-2 was the second in planned series of four flights. WSF is a 12 foot (3.7 meter) diameter stainless steel disk designed to generate an ultravacuum environment in space within which to grow thin films for next generation advanced electronics. Seven thin film growth runs were planned, but after three successful growths, WSF-2 placed itself in safe mode. Mission planners decided to extend the WSF-2 flying time by about 24 hours to allow all seven thin film growths to be performed. However, as preparations began to resume operations after a 20-hour hiatus, payload controllers on the ground could not trigger the flow of the thin film material and the WSF-2 was once again shut down. Film growth activities resumed after a six-hour cool-down of the WSF-2 instruments, and when spacecraft was retrieved on flight day eight, four successful thin film growth runs had been completed. WSF-2 was unberthed and hung over the side of Endeavour's cargo bay one final time for the Charging Hazards and Wake Studies (CHAWS) experiment, an Air Force sponsored experiment to collect data on the buildup of electrical fields around an orbiting space vehicle. On flight day ten, Voss and Gernhardt conducted a six hour, 46 minute spacewalk, completing the final primary objective of STS 69. They evaluated thermal improvements made to their extravehicular activity suits and reported they remained comfortable, and also tested a variety of tools and techniques that may be used in assembly of International Space Station. Additional payloads flown on STS 69 were: International Extreme Ultraviolet Hitchhiker (IEH-1), to measure and monitor long-term variations in magnitude of absolute extreme ultraviolet flux coming from the Sun; Solar Extreme Ultraviolet Hitchhiker (SEH), to accurately measure solar flux in the extreme ultraviolet region of the solar spectrum; Consortium for Materials Development in Space Complex Autonomous Payload (CONCAP IV-3), the third flight of an experiment that studies the growth of organic nonlinear optical crystals and thin films; Shuttle GLO experiment (GLO-3) to study the luminous shroud observed by astronauts on pervious Shuttle missions; Ultraviolet Spectrograph Telescope for Astronomical Research (UVSTAR), a pair of telescopes that measure extreme ultraviolet and far ultraviolet emissions and complemented SEH described above; Capillary Pumped Loop/Get Away Special Bridge Assembly (CAPL-2/GBA) consisting of the CAPL-2 Hitchhiker payload, the Thermal Energy Storage-2 (TES-2) payload in a GAS container, as well as four other GAS experiments on a single cross-bay structure. In-cabin payloads included Space Tissue Loss/National Institutes of Health-Cells (STL-NIH-C); Commercial Generic Bioprocessing Apparatus-7 (CGBA); Biological Research in Canister (BRIC); Electrolysis Performance Improvement Concept Study (EPICS) and Commercial MDA ITA Experiments (CMIX-4). STS 69 was also the second flight of a "dog crew," a flight crew tradition that began on STS 53, on which both Walker and Voss flew. As the Dog Crew II, each STS 69 astronaut adopted a dogtag or nickname: Walker was Red Dog; Cockrell was Cujo; Voss, Dog Face; Newman, Pluto; and Gernhardt, Under Dog. STS 69 ended on 18 September 1995 when Endeavour landed on revolution 171 on Runway 33, Kennedy Space Center, Florida, on the first opportunity at KSC. Rollout distance: 10,230 feet (3,118 meters). Rollout time: 56 seconds. Orbit altitude: 190 nautical miles. Orbit inclination: 28.4 degrees. Mission duration: ten days, 20 hours, 28 minutes, 56 seconds. Miles traveled: 4.5 million. The flight crew for STS 69 was: David M. Walker, Commander; Kenneth D. Cockrell, Pilot; James S. Voss, Payload Commander; James H. Newman, Mission Specialist 2; Michael L. Gernhardt, Mission Specialist 3. NASA's shuttle Atlantis docked at the Russian Mir space station during the fourth Shuttle-Mir docking mission. STS 79 was launched 16 September 1996. Aboard Atlantis in the payload bay were the Orbiter Docking System, the modified Long Tunnel, and the Spacehab Double Module, containing supplies for the Mir. The launch, originally set for 31 July, slipped when mission managers decided to switch out Atlantis' twin solid rocket boosters because the STS 79 boosters were assembled using the same new adhesive as the boosters flown on the previous mission, STS 78, in which a hot gas path into the J-joints of the motor field joints was observed during post-retrieval inspection. Although managers concluded the original STS 79 boosters were safe to fly, they decided to replace them with a set slated for STS 80 that used the original adhesive. The booster changeout took place after Atlantis was already back in the Vehicle Assembly Building due to the threat from Hurricane Bertha. A new launch date of 12 September was targeted, and Atlantis was returned to the pad. That launch date was delayed to 16 September when the Shuttle was returned to the VAB due to the threat from Hurricane Fran, marking the first time a Shuttle was rolled back twice in single processing flow due to hurricane threats. The countdown proceeded smoothly to an ontime liftoff on 16 September. Approximately 13 minutes into flight, auxiliary power unit number 2 went down prematurely. After review and analysis, the Mission Management Team concluded the mission could proceed to the nominal end-of-mission as planned. STS 79 was highlighted by the return to Earth of US astronaut Shannon Lucid after 188 days in space, the first US crew exchange aboard the Russian Space Station Mir, and fourth Shuttle-Mir docking. Lucid's long-duration spaceflight set a new US record, as well as world record for a woman. She embarked to Mir on 22 March in the STS 76 mission. Succeeding her on Mir for an approximately four month stay was John Blaha, who returned in January 1997 with the STS 81 crew. During her approximately six month stay on Mir, Lucid conducted research in the following fields: advanced technology, Earth sciences, fundamental biology, human life sciences, microgravity research and space sciences. Specific experiments included: Environmental Radiation Measurements to ascertain ionizing radiation levels aboard Mir; Greenhouse-Integrated Plant Experiments, to study effect of microgravity on plants, specifically dwarf wheat; and Assessment of Humoral Immune Function During Long-Duration Space Flight, to gather data on the effect of long-term spaceflight on the human immune system, involving collection of blood serum and saliva samples. Some research was conducted in the newest and final Mir module, Priroda, which arrived at the station during Lucid's stay. STS 79 also marked the second flight of the SPACEHAB module in support of Shuttle-Mir activities and the first flight of the SPACEHAB Double Module configuration. The Shuttle-Mir linkup occurred at 11:13 PM EDT on 18 September, following an R-bar approach. The hatches were opened at 1:40 AM EDT 19 September, and Blaha and Lucid exchanged places at 7 AM EDT. Awaiting Blaha on Mir were Valery Korzun, Mir 22 commander, and Alexander Kaleri, flight engineer. During five days of mated operations, the two crews transferred more than 4,000 pounds (1,814 kilograms) of supplies to Mir, including logistics and food, and water generated by the orbiter fuel cells. Three experiments also were transferred: Biotechnology System (BTS) for study of cartilage development; Material in Devices as Superconductors (MIDAS) to measure electrical properties of high-temperature superconductor materials; and Commercial Generic Bioprocessing Apparatus (CGBA), containing several smaller experiments, including self-contained aquatic systems. About 2,000 pounds (907 kilograms) of experiment samples and equipment were transferred from Mir to Atlantis; the total logistical transfer to and from the station of more than 6,000 pounds (2,722 kilograms) was the most extensive to date. Atlantis undocked from the Mir complex on 23 September at 7:33 PM EDT. Three experiments remained on Atlantis: Extreme Temperature Translation Furnace (ETTF), a new furnace design allowing space-based processing up to 871 degrees Centigrade (1,600 degrees Fahrenheit) and above; Commercial Protein Crystal Growth (CPCG) complement of 128 individual samples involving 12 different proteins; and Mechanics of Granular Materials, designed to further understanding of behavior of cohesionless granular materials, which could in turn lead to better understanding of how the Earth's surface responds during earthquakes and landslides. As with all Shuttle-Mir flights, risk-mitigation experiments were conducted to help reduce development risk for the International Space Station. 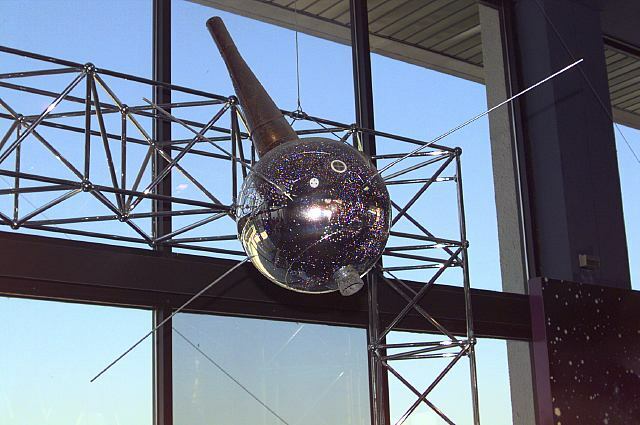 Flying for the first time was the Active Rack Isolation System (ARIS), an experiment rack designed to cushion payloads from vibration and other disturbances. Conducted near the end of flight was a test using the orbiter's small vernier jets to lower Atlantis' orbit, in preparation for the second Hubble Space Telescope servicing mission, STS 82, to re-boost Hubble to a higher orbit while still in the orbiter payload bay. On 25 September, Atlantis closed its payload bay doors, and at 11:06 GMT fired its OMS engines for a three minute long deorbit burn. After entry interface at 11:42 GMT, the spaceship flew across Canada and the US. STS 79 ended on 26 September 1996 when Atlantis landed on revolution 160 on Runway 15, Kennedy Space Center, Florida, on the first opportunity at KSC. Rollout distance: 10,981 feet (3,347 meters). Rollout time: one minute, two seconds. Orbit altitude: 196-245 statute miles. Orbit inclination: 51.6 degrees. Mission duration: ten days, 3 hours, 18 minutes, 26 seconds. Miles Traveled: 3.9 million. Lucid was able to walk off the orbiter into the Crew Transport Vehicle with assistance, and later the same day received a congratulatory call from President Clinton. The flight crew for STS 79 was: William F. Readdy, Commander; Terrence W. Wilcutt, Pilot; Thomas D. Akers, Mission Specialist; John E. Blaha, Mission Specialist (returned on STS 81); Jay Apt, Mission Specialist; Carl E. Walz, Mission specialist; Shannon W. Lucid, Mission Specialist returned from Mir (launched on STS 81). Spain's Hispasat 1D was launched from Cape Canaveral, Florida, which was placed in geostationary orbit at 30 deg W to provide video, data, and Internet services to Europe, North America, and North Africa via 28 Ku-band transponders. Hispasat 1D was a Spanish geostationary communications spacecraft launched 18 September 2002. The 3.3 ton, 7.0 kW satellite carried three antennas, looking in different directions, to provide video, data, and Internet services to Europe, North America, and North Africa via 28 Ku-band transponders after being parked over 30 degrees W longitude, alongside Hispasat 1A, 1B, and 1C.